Let’s face it, all help is self-help. Unhappy With Your Relationships? Change things! Let’s face it, all help is self-help. The only person who can think for you is you. Sure there are those who, from time to time, guide us and support us. But ultimately we have to discover how to help ourselves – find ways to do things that work, to unlearn bad habits and learn some good ones. 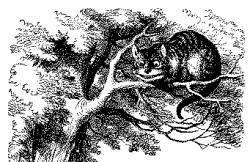 ‘Then it doesn’t matter which way you go.’ said the Cat. ‘.. so long as I get somewhere.’ Alice added as an explanation. Getting “somewhere” is what a lot of us do. Knowing where we want to go – and getting there – well now you’re talking about life as is should be. As Covey says, it’s important to always “start with the end result in mind”. Before we begin the journey, it’s important to know what we want. In the end, we lose the ability to dream of what could be. Without being conscious of it, we’ve put ourselves into a small small box. So part of the “work” that we need to do is get ourselves out of the box. 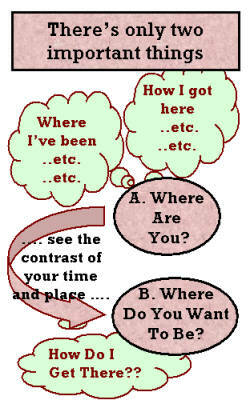 needed is – Point B – “Where do you want to go?”. With just those two pieces, Magellan lays out the course. What you need to get clear on is Point B – where you want to be. The Universe will plot a course for you. up with your vision in ways that you couldn’t orchestrate with a lifetime of effort. we invite you to come join us on our weekly Open Calls (they’re free). Bring your questions.